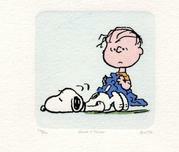 Peanuts debuted on Oct 2, 1950, drawn by Charles Schulz at the age of 28. Shulz is the most widely syndicated cartoonist in history, his work published in over 2,300 newspapers, 1,400 books and has won Peabody and Emmy awards for his animated specials, and is responsible for the most-produced musical in the American theatre, entitled "You're A Good Man, Charlie Brown". And all this diversity and recognition and continuous success began 45 years ago when the United Feature Syndicate ran the first installment of a comic strip it dubbed "Peanuts". 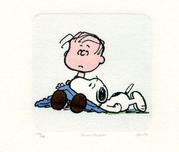 While Charles Schulz' strip deals in psychology, social commentary and often bitter humor, its hallmark is its perspective: all these issues experienced, evaluated, and ultimately decided upon by children. "There is a market for innocence" says Schulz, whose discipline still drives him to his studio every day "to get feelings of depth and roundness, and (to know) the pen line is the best pen line you can make...I don't think I'm a true artist. I would love to be Andrew Wyeth or Picasso...But I can draw pretty well and I can write pretty well, and I think I'm doing the best with whatever abilities I have been given. And what more can one ask?" -J. P.